Every player — beginner, weekend player or competitor — is always searching for more power and greater distance. Technology can help solve the problem with drivers designed to create more distance, but the player needs to know how to use the club to maximize its design techniques. To do so, Shields said golfers have to realize that the club shaft must properly stress, or bend, at certain times in the swing for speed and power. 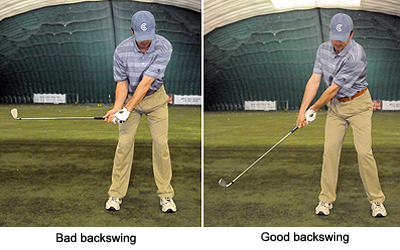 To get the shaft to bend, your body must lead the sequence both ways — in the backswing and during the downswing. Try starting your swing by using your body to pull the grip end of the club, not using your hands to move the clubhead. Then begin your downswing by settling on your front foot, again using your body to pull the handle. Remember, body leads back and through. That will help bend the shaft and generate more power. During his victory at the Arnold Palmer Invitational a month ago, Tiger Woods made a remarkable 58 of 58 putts from 6 feet or less. Johnson uses this statistic to tell students: Do not spend all your time just hitting balls at the range. Most players hit balls for an hour and hit a couple of putts before you rush off to the first tee. It should be the complete opposite. Aber said he learned a long time ago that good players have a consistent routine for putting. It doesn’t matter what the routine is, as long as the players consistently uses the same routine. • Here is Aber’s routine: After he has determined the line, he takes a practice stroke while looking at the hole, puts his putter behind the ball, takes one more look at the hole, and strokes the ball. “This is my routine,” Aber said. “You can come up with your own routine, but make sure you do it every time you hit a putt. This is very important and no different than a great free throw shooter. Tiger Woods has the same routine on every putt just as Michael Jordan had the same routine on every free throw. This is an area that is largely ignored and can really pay off in much lower scores. Especially because most average players usually miss the green in regulation. Jim Cichra said you should learn how to hit two types of chip shots — how to stop the ball and how to make the ball run. Set up with your weight on your front side (the left side for right handers), with a narrow, slightly open stance. Your hands should be slightly forward of the ball with the ball in the center of your stance. Make an even swing with the distance on your backswing closely matching the distance on your follow-through, and make sure you maintain an even tempo. Your length of swing will then determine the distance of the shot. And learn two clubs at first to gauge the reaction of the ball when you use them. A sand wedge and a 7-iron is a good start. Use the sand wedge when you need to stop the ball. Use the 7-iron when a running shot is called for. Always aim for a spot on the green where you need to land your ball to get it close. Therefore, you will need to know the reaction of the ball when it hits, whether it bites or runs. Also, consider whether the green is hard or soft, fast or slow, uphill or downhill. All of these factors will determine where you should land your ball. A lot of players go to the driving range and hit balls, but not many go with a plan and not many really pay attention to what they are doing. Parees said there are many facets to improving a golf game and just going to the range and hitting a bunch of drivers or a bunch of 5-irons isn’t going to necessarily make it a better practice session. First, warm up for 10 to 15 minutes, beginning with stretching exercises, and then start hitting balls with a wedge, using a smooth, slow swing. Work your way up to longer clubs until you finally get to the driver. Do not hit every club in the bag and do not fall in love with one club. Second, spend 10 to 15 working on a specific position or movement you need to improve. 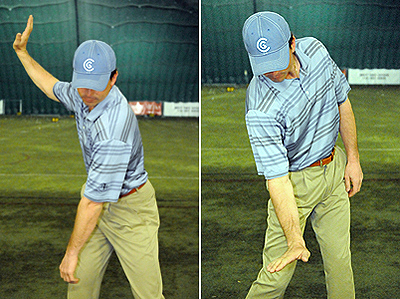 This is how you ingrain that movement in your swing. Begin with a short-iron and hit four balls doing a drill that will improve this area. Then hit four more balls with the same club taking a full swing. Repeat this eight-ball step with using a hybrid, fairway metal, then driver. Finally, work on your short game for 20 to 30 minutes. Pitch shots to various targets from 15 yards to just short of your maximum wedge distance; chip shots from 1 to 50 feet; hit short and long bunker shots; practice putting by using a circle drill in which you place six to eight balls in a circle around the cup, between, 3 and 5 feet away. Work your way around the circle, trying to make as many possible without any three putts. With a more focused plan when you practice, your game is bound to improve. Not every player gets to practice before every round with his teacher hovering behind him, watching his swing, checking for malfunctions, making sure everything is working just right. Just those on the PGA Tour. And not every player has the luxury of going for a lesson or visiting an instructor on a periodic basis, usually because the cost can be prohibitive. So, how do you become a better player? What is it that you need to know to improve your game and lower your scores, which is the desire of every player who has ever teed a ball, hoisted a club and tried like heck to make the ball go high, straight and, yes, especially long? Well, short of having a certified PGA teaching professional on your payroll, or taking one to the golf course every time you play, the Post-Gazette has asked five local professionals and PGA-certified instructors to provide a list of the top 10 tips a player should know and work on to become a better player. Consider it the PG’s version of Harvey Penick’s “Little Red Book,” a compilation of teachings, lessons and musings designed to help players understand the work, preparation and execution that is required to lower scores and make golf a more enjoyable game. Or just less frustrating. The participating professionals are John Aber, head professional at Allegheny Country Club; Eric Johnson, director of instruction at Oakmont Country Club; Kevin Shields, teaching professional at Rolling Hills CC; Sean Parees, teaching professional at Quicksilver GC and Robert Morris University Island Sports Center; and Jim Cichra, director of instruction at the Robert Morris University Island Sports Center. The tips are designed for players of all skill level, but primarily are geared toward the average player. And, with the average score in this country over 100, there are plenty of players in search of lessons to improve their game. The tips are not listed in order of importance. Also, keep in mind there are other tips that could be more useful to a player’s specific need. Still, these lessons represent a compilation of suggestions players should heed if they want to become a better player and shoot lower scores. Eric Johnson, who formerly worked with former European Ryder Cup member Per Ulrik Johansson, said the first thing a player has to do to get better is figure out where his game is weakest. Keep simple statistics of your own — fairways hit, greens in regulation, short game up and downs and total putts. From this, you can determine your weaknesses. The best solution that I have found for keeping statistics is shotbyshot.com, which helps you electronically track your rounds and gives you a handicap for each part of your game. This can provide a much more in depth look at your statistics and give you an idea what you need to work. The more information you have, the easier it is to solve a problem. One of the biggest reasons for hitting bad shots is poor alignment, Sean Parees said. Parees said the best way to avoid that is to develop a pre-shot routine that will accomplish two things: Proper alignment and proper ball position. Get behind the ball with your feet together and set your clubface down so it is facing an intermediate target. Then, as you look at your real target, take a small step with your left foot and slightly larger step with your right foot. This will ensure the ball is in the proper position in the left half of your stance, between the left heel and the center. To practice this, take two clubs and, placing them on the ground, use one to represent the target line and the other to represent your body alignment. Place a third club perpendicular to your body alignment to represent your ball position. This will help you aim correctly. The single biggest thing that separates average players from good players, good players from great players, and great players from Tour-caliber players is clubface control, said Kevin Shields. Assume a standard grip and try to “twist” your bottom, or right, hand so it faces away from you in the backswing, and keep it facing away the whole swing, as if you are wiping your palm across a table in the impact area. Many people don’t realize that what is considered by modern instruction to be “square” at the top is actually 90 degrees open. The clubface needs that much rotation to be square at the ball. Some of that rotation comes from turning your body, but most comes from your hands and arms. Learn to turn the face toward the ball sooner in the downswing.